Let’s face it: the language market is changing. English has been the lingua franca for a while now, but it’s not going to always be that way. It’s projected that Chinese or Spanish might take over the English language as the lingua franca in the next century. So it makes sense that you’re searching this audiobook: Spanish is an in-demand language to know. By knowing Spanish, you’re opening the door to communication with hundreds of millions of more people than you could speak with before. This makes you a desirable asset to a great number of companies and makes you an all around more well-rounded person. I’m not certain why you picked this book up. 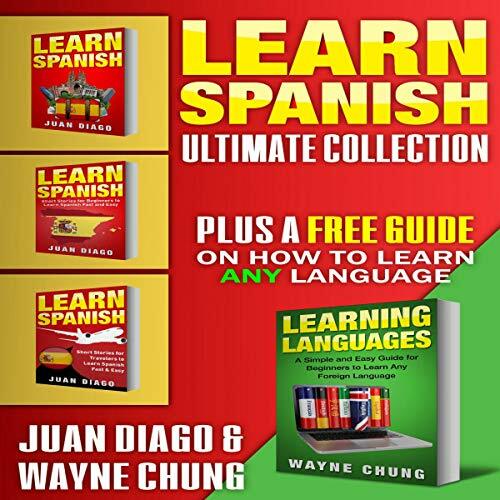 It could be general curiosity about Spanish, or you may be going on a trip and needing a crash course in Spanish before you do. Regardless of what your intent is, the key fact is that you’re looking for the best possible way to learn Spanish while getting the best bang for your buck, too. This audiobook is everything you’re looking for. Our brains are hardwired to act on a complex system of concepts and context clues in order to figure out the language. This is why most polyglots in the world will tell you that the absolute best way to learn a language is by simply immersing yourself in it. With this book, you’ll be going through different short stories, all of which follow the story of a girl named Maria and her kind family from El Salvador. Throughout the short stories, you’ll be challenged and pushed to your limits - that’s how you know the method is working. You’ll never be left in the dust, but you will most certainly be immersed in the beautiful Spanish language. After every short story, there’s an English version, in case you got totally lost, and a section with grammar tips and vocabulary to help you round out every short story with a proper lesson.